At the eighth day of development, the blastocyst is partially embedded in the endometrial stroma. In the area over the embryoblast, the trophoblast has differentiated into two layers: (a) an inner layer of mononucleated cells, the cytotrophoblast, and (b) an outer multinucleated zone without distinct cell boundaries, the syncytiotrophoblast (Figs. 3.1 and 3.2). Mitotic figures are found in the cytotrophoblast but not in the syncytiotrophoblast. Thus, cells in the cytotrophoblast divide and migrate into the syncytiotro-phoblast, where they fuse and lose their individual cell membranes. Figure 3.1 A 7.5-day human blastocyst, partially embedded in the endometrial stroma. The trophoblast consists of an inner layer with mononuclear cells, the cytotrophoblast, and an outer layer without distinct cell boundaries, the syncytiotrophoblast. 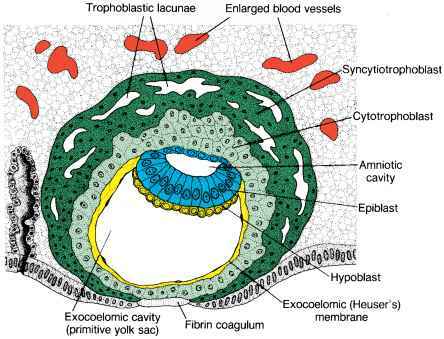 The embryoblast is formed by the epiblast and hypoblast layers. The amniotic cavity appears as a small cleft. Figure 3.2 Section of a 7.5-day human blastocyst (x 100). Note the multinucleated appearance of the syncytiotrophoblast, large cells of the cytotrophoblast, and slit-like amniotic cavity. amniotic cavity. Epiblast cells adjacent to the cytotrophoblast are called am-nioblasts; together with the rest of the epiblast, they line the amniotic cavity (Figs. 3.1 and 3.3). The endometrial stroma adjacent to the implantation site is edematous and highly vascular. 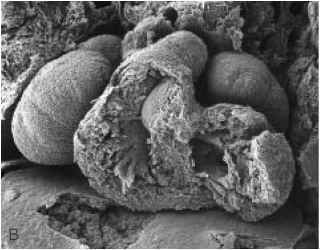 The large, tortuous glands secrete abundant glycogen and mucus. Figure 3.3 A 9-day human blastocyst. The syncytiotrophoblast shows a large number of lacunae. Flat cells form the exocoelomic membrane. The bilaminar disc consists of a layer of columnar epiblast cells and a layer of cuboidal hypoblast cells. The original surface defect is closed by a fibrin coagulum.